Google has just unveiled its upcoming location based recommendation search engine "powered by you and your friends." It's painfully obvious that location is one of the fastest-growing segments of the tech industry; Google has been iterating quickly in this area with improvements to Places, Images, Latitude and other services with location features. Its newest foray into the world of location-based services is Hotpot. 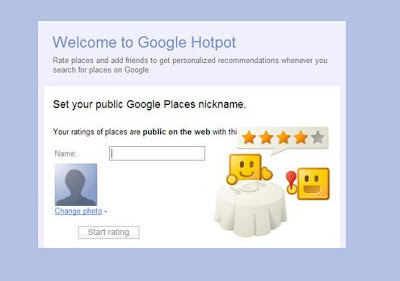 Hotpot takes all of Google Places' ratings and reviews features and adds a more personal touch. Currently, Place Pages mostly aggregate review data from sources such as Yelp. With Hotpot, users will be encouraged to rate and review businesses directly from their Google-linked profile. Users' ratings and reviews are tracked with a counter at the top of each profile, and likes and dislikes are remembered and used in Google's recommendation engine. In other words, it's aimed directly at average consumers, not web junkies who live to search. While Hotpot works well with Places data, its presentation is entirely fresh, both visually and functionally. It presents high-impact data (star ratings and images) for each place in a grid format without introducing too many details such as phone number or URL that might not be needed until the user decides to dig down another level or two. Another part of Hotpot is its social features. Users can create a profile nickname to separate their Hotpot account from their general Google profiles (the whole web can see the Places nickname, but only friends will see the linked Google profile and the user's real name). Google uses Gmail accounts and linked Google profiles to help users find their friends. Friends' reviews and ratings will be visible, and users will get recommendations based on what their friends like. When you search for specific places, such as "sushi Berkeley," in Hotpot, you can filter your search results to see businesses or other places you haven't rated before; you can also choose to see only places that have been rated by your Hotpot friends.